Music for games, film, video, corporate presentations, interactive and eLearning. Reveal Music I did some music and sound design for a turn-based strategy civilization-building game. One of the features of the game is that players can build these things called “Great Wonders.” Each completed Wonder enhances some aspect of your civilization, and the more you build, the more your society thrives in some way or other. It takes a lot of turns to build one, and you can’t build anything else while construction is going on, so when one is completed it’s kind of a big deal, and there’s this reveal sequence that lets you know you did something exceedingly cool. These are some of the pieces I wrote to accompany those Great Wonder reveal sequences. Another project at the same company – this was a concept we pitched to the publisher. I did the music for the trailer. This one is also from a trailer – the game being pitched was a space-opera fps. The guitarist is Harry Hmura, one of the top session players in Chicago. Children’s Educational Products These are cues I wrote to accompany some children’s educational products. The first three are from an eBook based on an animated movie about a young fish who gets lost. The book is a very abridged version of the original story, and the music had to turn on a dime to keep up. The challenge was to stay emotionally authentic throughout all the breakneck twists and turns of the narration. 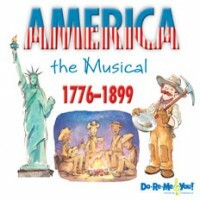 One of my favorite projects for kids was “America The Musical,” from Kindermusik.™ This was published as a book and CD, and told the history behind some of America’s most popular folk songs. I produced the CD, which included some humorous vignettes along with the songs, and did all the orchestral and vocal arrangements. “America The Musical” won a Teacher’s Choice award in 2005, and is still one of Kindermusik’s best selling titles. There are a lot more examples of children’s interactive work that I’m really proud of, but that, due to contractual agreements, I can’t have posted at this site. If anyone’s interested let me know on the contact page, and I’ll be glad to set up a private demo for you. Here are some corporate promo pieces I’ve done over the years.